Thinking about getting away from it all? Want to rest, relax, fish or scallop? Play Hooky! This new vacation rental, “Playin' Hooky” is the perfect place for all your vacation needs. This 3 bedroom 3 bath home sits directly on deep riverfront with just a short ride to the mouth of the Gulf. There is a private dock for your boat outside the screened front porch. Electric and water are provided at the dock. With 2 queen beds in each room, the cottage sleeps 12 guests. Each bedroom has its own attached bathroom, offering privacy for each room. You will find everything you need to prepare great family meals including pots and pans, dishes, glassware, silverware, blender, hand mixer, cutting boards and cooking utensils. The living area is large and open to the kitchen, providing plenty of room for socializing and the chefs won’t be separated from the rest of the activity. The large dining room table, kitchen bar and porch table provide plenty of seating for your crowd. A washer and dryer are provided, so you can clean up after a day on the water. Parking is provided under the house, as well as in the circular driveway. Bring your bicycles or rent them at the local marina and ride around Steinhatchee. If peddling isn’t for you, golf carts are also available for rent in the Hatch. We will be happy to provide information regarding golf cart rentals. Come dinnertime, enjoy one of our restaurants in town, or cook your catch in the cottage or grill it on the grill in the riverfront of the house. Steinhatchee has always been an angler's paradise. The pristine shoreline and shallow grass flats provide habitat for an abundance of salt water fish. In the summer season, you can try your hand at some of the finest scalloping in the world. 2018 Scallop season is June 16 - September 10. Whether you've come to give fly fishing a try, ease downstream in a canoe or kayak, or capture the glorious scenery that abounds on a ride on the Steinhatchee River, it's yours for the taking. 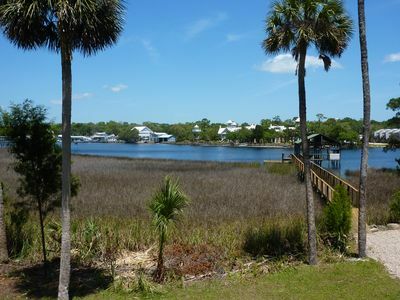 So, enjoy relaxing on the furnished porch of your private cottage, a ride on the river with family and friends, fishing, scalloping or simply sitting dockside and drinking in the glorious scenery. This is what “Playing Hooky” in the Hatch is all about! Come see us, you’ll be glad you did! Please note there are security cameras monitoring the outside/public areas of the house. No personal or inside areas are on cameras.